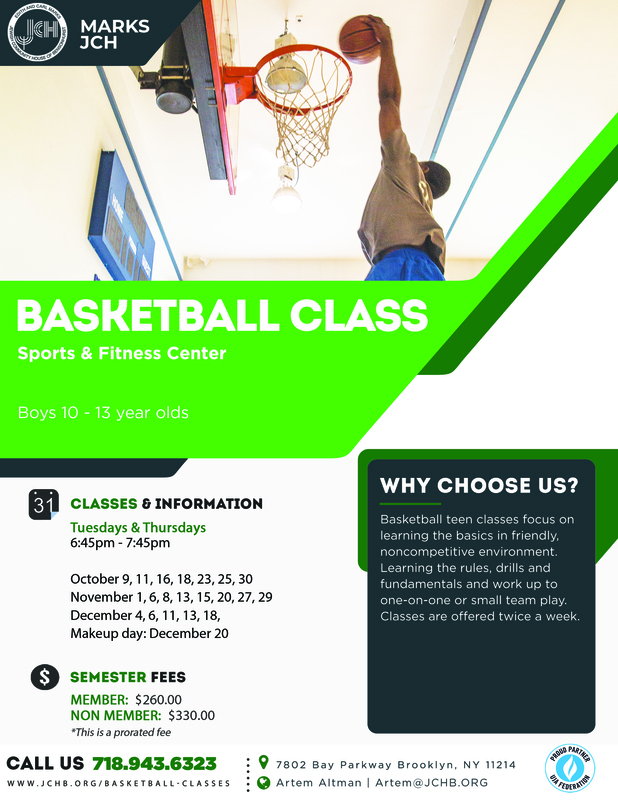 Basketball teen classes focus on learning the basics in a friendly, non-competitive environment. Learning the rules, drills, and fundamentals and work up to one-on-one or small team play. Classes are offered twice a week. Registration: Classes fill up quickly on a first-come, first-served basis, so please register early. Basketball youth classes are offered as part of Sunday Academy. Tuition is paid upon registration for each semester. All payments must be made in full at the time of registration. Each semester consists of 20 classes. Classes are 60 minutes long. Membership rates apply to Children, Teen and Family members. Please read our payment policies. * Membership rates apply to Children, Teen and Family members. Please read our payment policies. The Cammarata Basketball Leagues have been a JCH tradition for years. Individuals and teams from all over Brooklyn gather in our gym for friendly competition. Youth basketball leagues is a great opportunity to fine-tune skills, practice good sportsmanship and practice competitive play. Games are played on Sundays. Ages: Leagues are offered for children ages 9-12. You can join as an individual or a team.